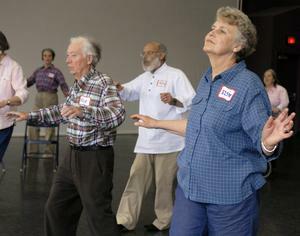 The Stanley J. Wertheimer Fellowship Program provides in-depth training and mentorship opportunities to exceptionally qualified teachers interested in offering high quality dance classes for people with Parkinson’s disease modeled after those jointly created by the Mark Morris Dance Group and Brooklyn Parkinson Group in Brooklyn, New York. The Fellowship program covers two years of Dance for PD® workshop tuition and membership fees for new and existing Parkinson’s dance teachers so that they can receive extensive training and professional development in the program’s approach and methodology. With their teaching experience, training, compassion and dedicated focus, Stanley J. Wertheimer Fellows exemplify the best practices of the Dance for PD program, allowing Dance for PD to make a significant impact in new communities and allowing more people with Parkinson’s disease to have access to this specialized approach to movement and music. Come meet our current fellows here. Candidates who are interested in becoming Stanley J. Wertheimer Fellows must demonstrate a commitment to developing and teaching a Dance for PD program in their own communities. Candidates who are current teachers must demonstrate a successful track record in their existing programs. Both new and existing teachers must have strong dance teaching credentials and present a written endorsement of their plan or program from a recognized local PD support group, medical center or PD organization. Program staff will review each Fellow’s progress after the first year to ensure that Fellowship guidelines and objectives are being followed. ►Tuition-free training at unlimited introductory and advanced workshops for two years. ►Free membership in the Dance for PD program, allowing online access to special support resources, a dedicated listserv for teachers, and other materials. ►On-going mentoring and support from Dance for PD founding teachers and staff. ►Letters of support from program staff. ►Invitations to conference calls with other Fellows. ►Access to visit and observe other Dance for PD network classes around the world (local permission required). ►Candidates must complete a written application and submit a written endorsement of their project or existing program from a recognized local PD support group, medical center, or PD organization. ►Fellows are required to submit two brief progress reports a year to Dance for PD program staff and Fellowship underwriters. ►Fellows can reapply for the program for one additional extension year after the first two-year Fellowship is completed. ►Please note: online course fees and certification fees are not covered by the Fellowship. ►Fluent proficiency in at least one major dance style (ballet, classical Indian, modern, jazz, tap, West African, ballroom etc.). ►At least five years experience teaching dance technique in a group setting. ►Strong musicality and the ability to work with an accompanist. ►Commitment to launching a local Dance for PD program within one year after completing the first workshop. ►Existing association with an established team of collaborators to launch a program (teachers applying without endorsement from a PD group or medical center will not be accepted). ►For existing teachers, a track record of success teaching a class that follows the Dance for PD approach. Please download an application here. If you would prefer to complete a fillable application using MS Word, please click here. Stanley J. Wertheimer was Professor Emeritus of Mathematics at Connecticut College, where he was Chair of the Mathematics Department and Director of Academic Computing. In 1971, he spent a sabbatical year living in England, where he discovered his passion for pottery and English folk dancing/Morris Dancing. As a potter and a dancer, Stanley possessed a special insight into the creative process that inspired his perspective on teaching. Focusing on his understanding of the conjunction between mathematics and the arts, he motivated his students to use creative tools to master and find meaning in mathematics. His preferred method of teaching – relying more on class participation and presentations rather than lecture and testing – was enthusiastically adopted by most of his students. In his last active decade he gave no tests, and no grades until the end of the term. Generations of students were able to learn by doing, rather than listening and mimicking. In 1990, Stanley was diagnosed with Parkinson’s disease. Understanding how important it is to have good information and to find ways to partner with others in the Parkinson’s community, he founded, in 1994, a Parkinson’s working group. The goal of the group was to provide education and support for people with PD and to collaborate with the medical community to enhance treatment and research. In his role as an advocate and educator he has inspired and helped countless people with PD. His interest in Parkinson’s disease and dance became focused in 2008 through the joint efforts of the Brooklyn Parkinson Group and Mark Morris Dance Group. Over the years Stanley remained an active potter having several shows at local galleries. In addition, his work was featured in the Parkinson’s Disease Foundation’s “Creativity and Parkinson’s Insights”, as well as their yearly calendar. Stanley had three children and six grandchildren – two of his own and four by Gunilla Norris, a psychotherapist, author and his partner of 16 years. Before his passing in March 2016, Stanley lived in Mystic, Connecticut. For a news segment about Stan’s story, please click here. The Stanley J. Wertheimer Fellowship Fund is not only inspired by Stan’s work, but also by his mother Belle, who lived with Parkinson’s disease for most of her life – her courage and determination set an example for everyone around her.